and expect me to hop right to it. to get started on the project. Guess which approach I prefer. 1. How do you want your business name to be worded? Knowing not just the official name of your business, but how you want it to be worded in the logo saves a lot of time. If you have a really long business name and want it abbreviated with an acronym (think: NASA), that needs to be disclosed up front. If for legal reasons you need to include an LLC, Inc., or some kind of certification designation, that is information a designer needs as well. The products and/or services that your business offers plays a pretty big role in whether a certain type of visual branding is a good fit. Nobody wants to have their law firm mistaken for a day care, or their burger joint mistaken for a laundromat. Knowing your specific trade and offerings will help a designer make sure your visual branding speaks what you do clearly to customers, is a good fit for your industry, and isn’t too similar to competitors in your field. 3. Who does your business serve? The visual branding for a business that wants to attract leather-wearing biker dudes is going to be MUCH different from the visual branding for a business that wants to target single moms on a budget (or at least it should be!). Knowing WHO your business is meant to serve and the type of customer you are trying to appeal to helps a designer craft your new logo accordingly. And no, ‘everyone’ is not a target market. 4. What is your business’ personality? If your business is going to have a fun, casual, upbeat vibe, that needs to be reflected in the visual branding, and that starts with your logo. Knowing not only the personality you want your business to exude (formal? funny? cool? ), but the qualities you want it to be known for (modern? handmade? opulent?) will help your designer zero in on the perfect look. Colors and fonts all have moods and personalities. Your designer can make sure what they deliver matches up with where you’re aiming. 5. What is unique about what your business offers? Unless you’ve literally created a new invention, there are going to be other businesses out there offering the same things as yours. The question you have to answer for customers is why they should pick your business instead of one of the many others out there. “Mine is better,” you say. Ok: why? What makes it better? What are you doing differently? If you know what that unique point it, what your leg-up on your competition is- tell your designer! There may be a way to hint at this factor in your visual branding, but that won’t happen if your designer doesn’t know about it. Simply making sure your designer has all of the above information will dramatically increase the quality of design concepts you get back, and how well they fit your business. Most people can rattle off #1 and #2 pretty easily. #3-5 take a bit more time and thought. If you haven’t already clarified those points for your business, it’s a helpful and useful exercise not just for your logo design, but your branding and marketing in general. And if your designer isn’t asking you these questions? Maybe it’s time to look for another designer. 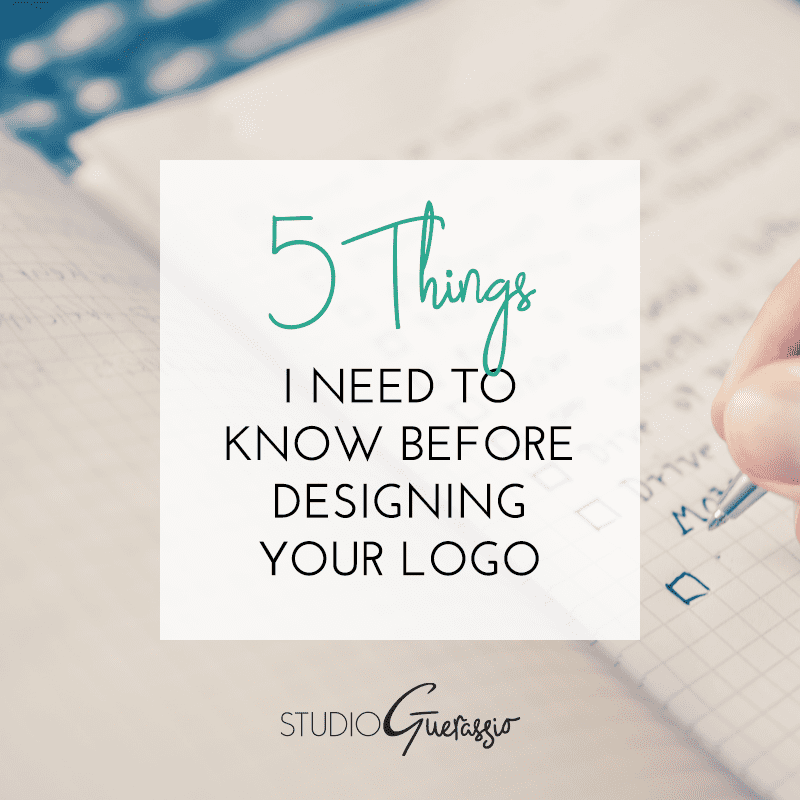 Did you think about these details when your logo was designed? *My branding questionnaire has more than just 5 questions, but they’re all aimed at getting the details behind these broader questions. Helping you hone in on the perfect visual branding is part of my job. If you have a new creative or lifestyle business and are struggling to come up with a logo, check out my full visual branding package, especially for new business owners.